Proving that all press is good press when it comes to real estate, Rafael Viñoly—the architect behind two recent death-ray skyscrapers—revealed plans for a new skyscraper in Lower Manhattan today. It'll be his second tall building in NYC, and like the first, this one is conspicuously free of curved surfaces. The tower will add 70 stories of luxury housing stock to Lower Manhattan when it opens in 2017. What's going on with the design? Not terribly much, yet. 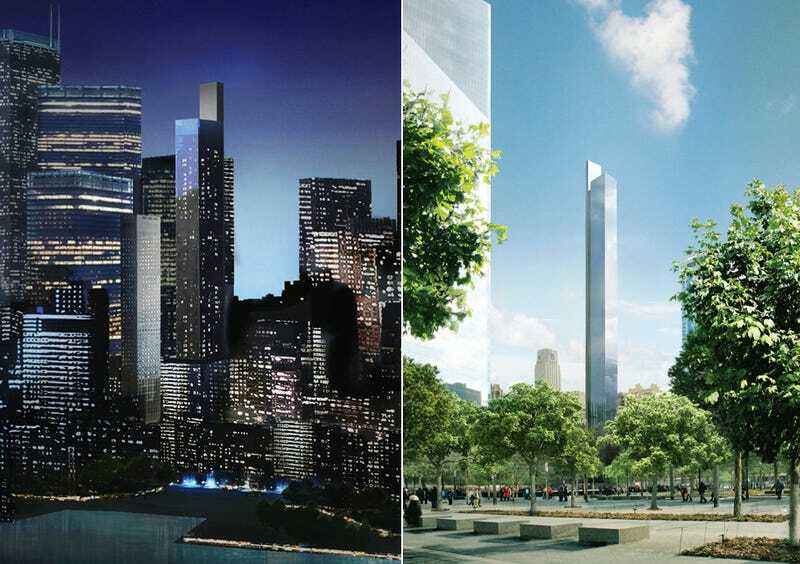 The new renderings—which appeared on NY Yimby today—show a super-thin monolith hung with a glass curtain wall, lined with long vertical window louvres that look like pinstripes. On one side of the square extrusion, an opaque volume will probably contain the building's services core and elevators, leaving the other three sides of the building open to views of the city. One curious detail is the protrusion of the long white slab above the building's top floors—it's unclear what's going on here, though this could be a way to push the building's height up. Though its final height isn't set yet, 22 Thames could easily be the tallest residential building in downtown Manhattan—possibly topping out at between 850 and 1,000 feet. But a crown could add as much as a hundred feet to the building—and that could make a huge difference. After all, the recent decision to name One World Trade as the tallest building in the country came down to semantics: If the building's spire was "architectural," it counts towards the official height. It&apos;s Official: The WTC Is the Tallest Building In the U.S.